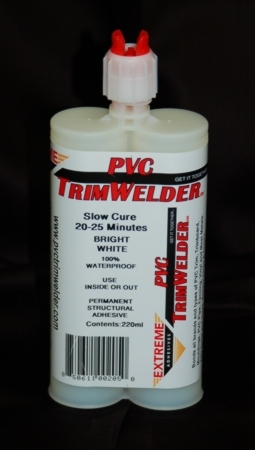 PVC TRIMWELDERtm SLOW CURE Adhesive is a slower curing, two-component adhesive formulated and colored for PVC Trim Board applications with a work life of 15 to 25 minutes at 70º F after mixing. It is a creamy, medium viscosity, solvent-free structural adhesive that is EPA and CARB compliant. Cured performance shows excellent adhesion and bond strength. Adhesive joints are ready to handle in 90 to 120 minutes.